Visits: 32780 persons viewed this recipe. 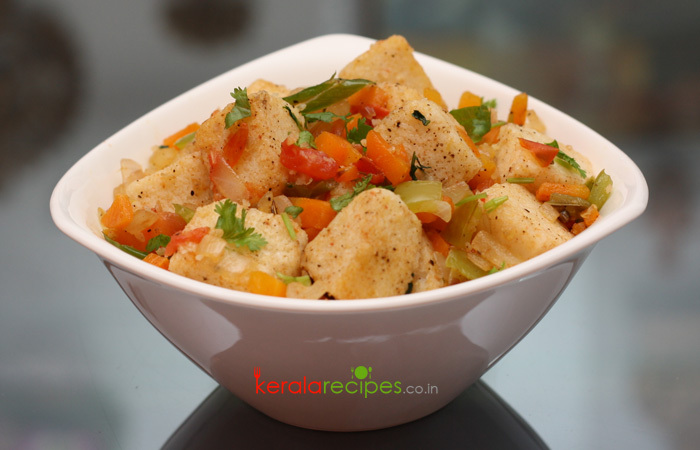 Idli delight can be served as a snack or even main dish; in either way, it is easy to prepare and delicious. Most of the mothers always face a problem that their kids dislike idli. The idly delight will surely help them to overcome this hindrance. Cut the Idli into bite size (cube shape) pieces. Chop onion, carrot, capsicum, green chilli and coriander leaves finely. Cut the tomato, remove the seeds and chop it finely. Add chopped onion, green chilli, capsicum, carrot and salt. Sauté it well. When it is 80% cooked, add chopped tomatoes and sauté it for few more minutes. Proceed to add idli pieces, coriander leaves and pepper powder. Combine well and cook it about 2-3 minutes by stirring occasionally. Idli delight is ready for serving, transfer to the serving dish. 1) You can include or exclude a vegetable, depending on the availability. Cabbage or similar kind of vegetables can be used. Good idea for Moms to help their kids to have vegs, Thank you. You are welcome Jainy, thanks for taking time to share your feedback here. I am also fond of cooking and like to experiment a lot. Will try this one for sure. Recently I have started going through your blog….. I am gonna try a few of your dishes….. but my personal opinion is that for sure your dishes will be tasty.. coz it looks so…… I have two kids and they love me cooking new recipes….. so I am gonna try your dishes sir and definitely everyone loves kerala recipes… and that too… payasam… I am very fond of it. Please do send me any new recipes you try & also send more payasam recipes…. Priya, Thank you so much for such a wonderful feedback. Happy to know that you love Kerala payasam very much. I have already posted three payasam recipes. Please check it out here. Will try to include more. Once again thanks for your kind words of encouragement. Looks wonderful will try this tomorrow (Sunday). Thanks Salilal, hope you will share the feedback. Hi Shaan, presentation is more important in coking. That is there in your recipes, which intend to cook that recipe on seeing it. I love cooking and like it to present in a pleasant way. All receipes are good and simple to do. Gomathi, Thanks a lot for sharing your feedback.